So the Labor caucus finally took Malcolm Turnbull's advice. The Liberal frontbencher's much-quoted remark about the strange phenomenon of a party whose hatred of a deposed leader was stronger than its instinct for survival pithily summed up the last three years in Australian politics. But last night that long-repressed survival instinct welled up and surfaced as Kevin Rudd reclaimed the Labor leadership with the support of 57 out of 102 members of caucus. The question is whether the instinct has taken hold too late to make any difference to the result of the federal election. There will be many, not least the 45 ALP MPs and senators who voted for Julia Gillard, who will see this as a contemptibly cynical analysis of the ousting of Australia's first woman prime minister. Already a narrative is emerging, especially in social media, of the martyrdom of St Julia. Some say Rudd's return is entirely to be attributed to sexism and misogyny. Others blame media obsession with opinion polls, apparently believing that voters have no view until a pollster's questions prompt — or even guide — them in forming one. Of the latter claim, suffice it to say that it oozes the elitist disdain for ordinary voters of those who utter it. Lest we forget, one consequence of compulsory voting is that a long-term trend in the polls almost always indicates the election result. And what they have been indicating is that Labor is headed towards the greatest defeat in its federal history, with its numbers in the 150-seat House of Representatives likely to shrink from 71 to as few as 35, and with nine ministers likely to lose their seats. Yesterday that dismal prospect even focused the mind of Bill Shorten, one of the factional chieftains who manoeuvred Gillard into the Lodge in 2010. Announcing he'd abandoned his oft-declared support for her, Shorten said people close to him would resent his decision. He did not only mean longtime associates such as the Australian Workers Union boss Paul Howes, another powerbroker of the ALP right who helped propel Gillard into power. Doubtless he also had in mind his wife, Chloe Bryce, leader of the Women for Gillard campaign. As for the role of sexism in Gillard's downfall, her own comment during her press conference last night got it right. She said that sexism partly, but not wholly, explained the political obstacles she has faced. Of course she has suffered insults and humiliations that male politicians in 2013 typically do not encounter: most recently and notably, the offensive remarks about her body included in the menu for a Liberal candidate's fundraiser and the asinine questioning of her partner's sexuality by a radio shock jock. But to see the attitudes expressed in such behaviour as the sole explanation of her massive unpopularity among voters — women as well as men — is to have a very selective memory indeed. The reality, evident to anyone willing to acknowledge it, is that there has always been a simmering distrust of her because of the circumstances in which she replaced Rudd in 2010. When voters heard her respond to the undermining of her own leadership by pleading for loyalty and party unity, she simply lacked credibility. Add in a succession of misjudgments in office and you have the mix that led to yesterday's events. Voters had simply stopped listening to her, giving Tony Abbott and the Coalition a free run. The misjudgments were truly staggering, and started early. Remember her promise in June 2010 that she would resolve the three problems — increasing boat arrivals, attacks on the mining tax and the botched emissions-trading legislation — that seemed to be dragging Labor to defeat in that year? The first of many boat-arrival 'fixes' was the East Timor solution; except she forgot to ask the East Timorese government before announcing it. The mining tax was saved by making concessions to the biggest three miners that gutted it as a revenue measure. And carbon emissions? The breaking of her pledge in the 2010 campaign that there would never be a carbon tax has dogged her ever since. 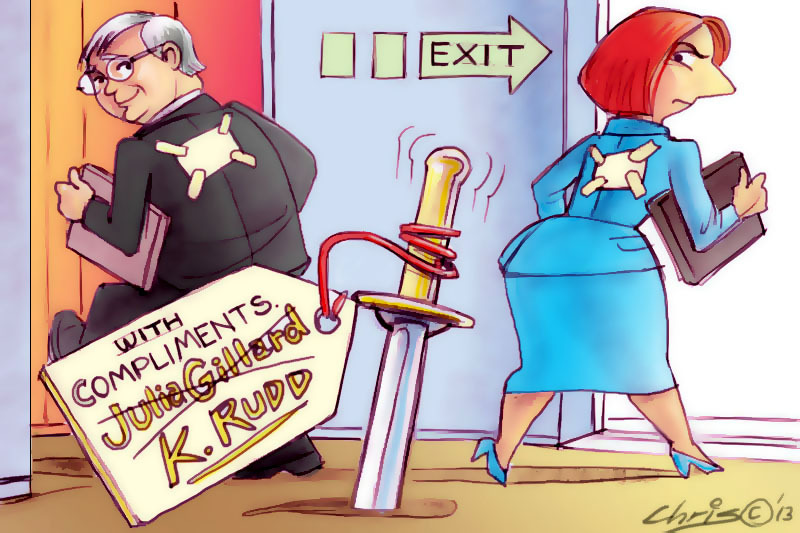 Can Rudd now fare any better? He is a formidable campaigner and consistently rates well above either Abbott or Gillard when poll respondents are asked who is their preferred prime minister. What is more, Labor has a success story to tell about the economy, which in considerable part derives from his support for stimulatory spending during the global financial crisis. Thus far, however, the Government has failed to sell that story, because Gillard and her deputy and Treasurer Wayne Swan, who last night chose to follow her to the back bench, have allowed the Coalition to pretend the state of the economy and the state of the budget are the same thing. Yet nearly all other OECD countries wish they had Australia's low net public debt, and most of them wish they had its growth and unemployment rates. So Rudd can campaign on Labor's economic stewardship, as well as the fundamental social-democratic reforms that will be Gillard's legacy: disability insurance and the Gonski restructure of education funding. Against all this the coalition will remind voters at every turn of the hatred that many of Rudd's caucus colleagues have for him. The result could still be that voters, weary and disgusted with Labor's divisions, will sweep the Government away regardless of their preference for him as prime minister. And if they may get a chance to do it sooner than the declared election date of 14 September, if the second Rudd Government cannot win the support of at least five of the seven crossbench MPs in a no-confidence motion. That would not result in a constitutional crisis, as some ill-advised Canberra journalists have claimed. On the contrary, it would be a matter of constitutional conventions working as they are supposed to do. Possibly the most perceptive observer and chronicler of The Rudd Resurrection is David Marr, who wrote a Quarterly Essay on the Man Who Would Be King. He thinks Rudd may have learnt something. One sincerely hopes, even prays, so. Forget the beaming, fake persona. This is a man with serious character flaws. As Goss's "enforcer" he was the hard man with the public service. Much of his approach to politics is overly cerebral and impractical. His behaviour sometimes verged on the narcissistic. Forget the pictures of him attending St John the Evangelist in Bulimba. As the late Fred Daley said, some of the worst men he met in politics were self-confessed Christians. A choice between "St" Kevin and "Father" Tony: I'm underwhelmed. At last a reasoned analysis of the tragic events of the past three years of the ALP. I believe Kevin Rudd, again PM, can make a positive difference to ALP standing. I believe a few seats can now be salvaged in September. And I also believe that Rudd, a very bright man, will have learnt from his past errors as PM. He will certainly try to be more inclusive of his Cabinet, and to treat his staff much better than before. You make no mention of the unrelenting bias and hostility of the Murdoch media empire. "tells the story" . That is the problem with all three of them (Abbot, Rudd and Gillard) they're all good at telling 'stories' when the electorate is interested in the 'truth'. the biggest test they all fail is the test of true Christianity when it comes to dealing with asylum seekers. In this Gillard at least could be excused for being a non believer. But the other two who bare their Christianity on their sleeves would be hard pressed to explain turning the boats back and the Malaysian solution. Where's the true "story" there? Bruce Laidlaw, if you were referring to my post, be assured, I have NO time for the Murdoch Press at all! And I'm fearful for the future of Fairfax! I'm a left winger, through and through. Your phrase "the martyrdom of St Julia" does you no credit Ray. Snide and mean-spirited, slanting your reasoned analysis in the direction of the tone which has made so many of us despair of recent politics. If only for the grace which Ms Gillard portrayed last night, she deserves better. Ray, Julia Gillard has had two opposition leaders with which to contend: one inside and one outside her party room. You have been a campaigner for one of them. You have gone on and on about the way in which Rudd was dismissed. In 2010 Gillard asked to challenge his leadership and he refused to be humiliated by the public knowledge that four fifths of his parliamentary colleagues could no longer work with him. So he resigned. The myth of the faceless men has been kept alive by anti-Gillard media including you. For three years she has led a hung parliament through skillful negotiations and achieved a reform agenda second to none. It does not make her a saint, as you so crassly suggest her supporters are doing. It makes her a good prime minister. This piece follows much the same path as most other commentary & misses the main point. Our politics generally are in a deplorable state on both sides. Australians generally are the real losers as politicians are the servants of us the people. Their antics belie this and treat the nation with utter disdain despite the pleasant words after the knife has fallen. Voters should wake up and send a clear message that enough is enough - to both major parties! And what no pollie will state is that it is not our right to stop one person getting on one boat to come here if they are not safe. With the report this week of torture, death and abuse in Indonesia, Nauru and Manus Island why don't the media just accept that it is a legal right to seek asylum and stop this incessant whinging. "The offensive remarks about her body included in the menu for a Liberal candidate's fundraiser." Here we go again. Fatima Measham, Brian Howard and now Ray Cassin... There seems to be a desperate urgency amongst this site's columnists to keep the "Sexist Liberal Party Menu" myth in circulation, long after the spoiling factual matrix has emerged. I can only conclude it is because actual sexist attacks on Julia Gillard by conservative politicians, if any, are too thin on the ground. This theory gains credence when we remember that, in her desperate fin-de-régime tirade on the floor of parliament, Julia Gillard's clinching argument to profile Tony Abbott as a misogynist was that: he was anti-abortion. I am amazed at Ray's opinion that Rudd may have changed or even improved. this is a man who treated his subordinates with high handed contempt, who worked behind the scenes to sabotage julia(and I am no fan of hers but she deserved better) and who, even last night delayed every one for over 30 minutes before appearing at 10.45 for his agreed 10.15 speech. Changed? I don't believe it! I don't expect Rudd to get any sort of bounce in the polls to justify what happened. I would be surprised if there is much movement at all. Time will tell if he is a changed man. Concerning the sideshow, the sexist Liberal party menu is hardly a myth. Santa Claus is a myth, this is not. Wheeling out a fall guy to take one for the team does not take the mud off anyone's hands. Dumb, tacky things happen on both sides of politics. They embarrass the wiser heads of both parties. Trying to cover them up just draws attention to them. Just for those who don't bother keeping up on this. The "menu" was not drawn up by a member of the Liberal party but by the Restaurant owner who, according to a Peter van Onselen, votes labor. The sheet of paper was not circulated at the meal: no one at the function saw it at the time, including Mal Brough. The tweeter of the myth that it was circulated was an anti-Liberal ex employee. So, sexist comments by a labor man attributed falsely to the Liberals by an anti-liberal guy. There's nothing new under the sun. Well said HH. It is sad, that you had to remind Ray Cassin of what had been plainly stated elsewhere. Having said that I liked Ray Cassin's attack on those who think that voters cannot think for themselves. Just for those who think the menu sideshow outlined above might just be a highly convenient fiction by people attempting damage control, all we have is a story by a political writer who may or may not be trying to hose the whole thing down. We don’t know that the "menu" wasn’t circulated at the meal, we don’t know for sure that Mal Brough did not see it, we don’t even know with certainty the politics of the alleged anti-Liberal ex employee. Therefore we cannot say with any authority that sexist comments were by a Labor man, although I am sure Labor is not immune from sexism. An equally likely explanation is that they wheeled out a fall guy to take one for the team which, as I wrote before, does not take the mud off anyone's hands. There is indeed nothing new under the sun. I wondered HH how long it would take you to bring abortion into the discussion. So in your opinion 'Gillard's clinching argument to profile ... Abbott as a misogynist was that: he was anti-abortion'? Me thinks you missed the rest of her speech where she gabe plenty of examples of mysoginist behaviour. In any case, it's no news that Abbott is anti-abortion. What Gillard was saying is that Abbott seeks to deceive in saying that he would not change abortion laws whilst staying silent on what he would do about funding abortion. Whatever one believes about the rights or wrongs of abortion, it is clear that Abbott is being less than truthful when he seeks to leave the impression that he would not act to make abortion more costly and less available. "We don't know" "...we don't know for sure"... Therefore we can assume and proclaim it was a Liberal Party sexist menu. Guilty until proven innocent ... the left's 'golden thread' when it comes to conservatives? GM, you should read Gillard's speech: she chided Abbott for saying that abortion was "the easy way out" (which it is). Which implies he might (but not necessarily WILL) do something about that - the MIGHT being precisely her point. So, no deception there from Abbott, if he does in fact do something legislatively - which I fear he won't, sadly. Ergo, no sexism-by-deception as you imply. Moreover, even if he doesn't, it's not "sexist" to point out that abortion is "the easy way out". Many women agree, including heaps who've had abortions themselves, or who are pro-choice. See, eg., Frances Kissling (founder of "Catholics for a Free Choice"). It is precisely because “we don’t know… we don’t know for sure” that we can think of it as very convenient spin to cover up a very inconvenient truth. As for “guilty until proven innocent”, this is just what the coalition and their jocks and far right bloggers did to the former Prime Minister in the final Parliamentary days of 2012. The current whinging about "guilty until proven innocent" underlines the double standard of far right bloggers who are equally adept at spinning the golden thread.